Unlike other climbing plants, climbing roses are not true climbing plants. 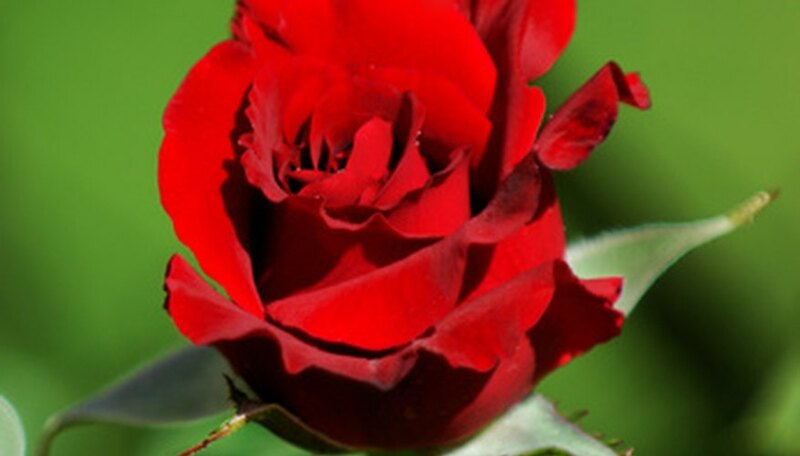 These roses produce long canes that are easily attached to a trellis, garden arbor or a wall. Climbing rose gardens require annual pruning and maintenance to keep them looking balanced. Proper pruning helps improve rose health and encourages blooming. One of the trickiest tasks for a climbing rose gardener is knowing the proper season for pruning the rosebushes. Climbing rosebushes require annual pruning for best results, as it is important to remove diseased or damaged wood each growing season before a few damaged canes negatively affects the entire bush's health, according to Andrew Schulman of Fine Gardening. Establish pruning as part of an annual rose garden maintenance schedule to encourage blooming, keep size in check and treat common rose problems. Throughout the much of the U.S., March is the ideal time for pruning rose bushes, according to the gardening experts at Ed Hume Seeds. Roses should be shaped and pruned before they produce new rose buds in the spring. Prune just before the threat of frost passes in early March. Roses in southern climates may require pruning a bit earlier, in late January or early February. Pruning roses in the late winter helps encourage blooming on new-cane growth. With climbing roses, begin by cutting away dead, diseased or damaged canes. Next, balance the rose bush by choosing the healthiest four to six canes and pruning away competing canes. Prune off any canes that have not produced many blooms in previous seasons. Many climbing roses do not bloom on new canes until their second grooming season. Severe pruning and cutting off all the old wood can mean a season with no rose blooms, warns Ed Hume Seeds. Many climbing roses experience two rounds of blooming during the growing season. First, roses bloom on older canes followed by blooming on newer canes, according to Schulman. Deadheading rosebushes helps encourage an extended blooming season. Using pruning shears, gently clip off flowers as they begin to turn brown and die out. Roses are likely to bloom again after a deadheading session.